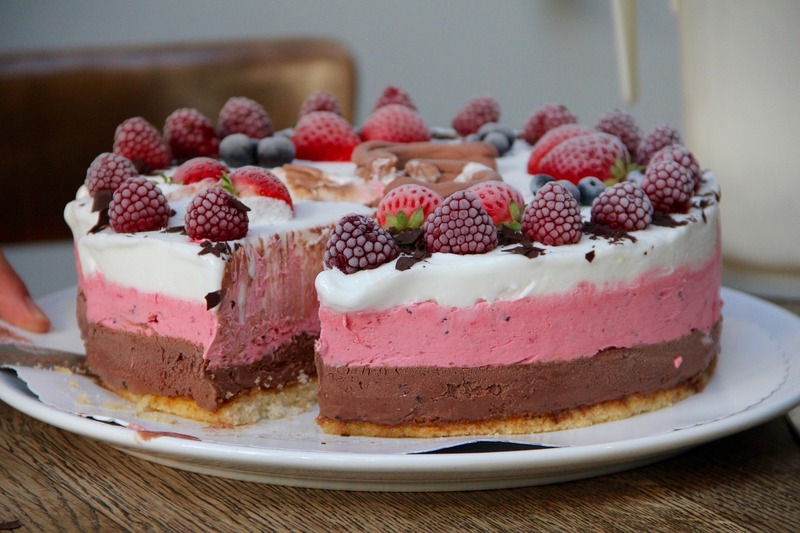 Chocolate, raspberries, ice cream, and pie? This dessert has everything you need to suit your sweet tooth. And what better way to wake than with a fragrant cup of Chocolate Raspberry coffee and a slice of this Chocolate Raspberry Ice Cream Pie from WomansDay.com? Place your vanilla ice-cream in refrigerator for 30 minutes to soften while you prepare the crust. Spray a 9-inch pie dish with a nonstick agent. Pulse your crackers in a food processor until fine chopped. Now add your butter and sugar; pulse until crumbs are coated and moist. Press crumbs firmly on the bottom and sides of your pie dish. Place in freezer for 30 minutes. Next, you’ll pack the softened ice-cream into the crust with the backside of a large spoon and spread evenly. Place in freezer for 15 minutes. Repeat with chocolate ice-cream and freeze for 3 hours. Then add 1⁄2 pint of raspberries to the top of your creation. Add whipped topping on berries and spread evenly. Add the rest of your berries,and garnish with curls of chocolate. Serve and enjoy! Does your dessert have you screaming for ice-cream? We want to see your creations! Take a photo and post it to our Facebook page, or comment below and tell us if your pie was a dream or a scream–or both!